ABC was a Michigan fan company which had an early entanglement with Sturtevant and a joint integration in a foreign owned division at the very end of its history. That story is told below. 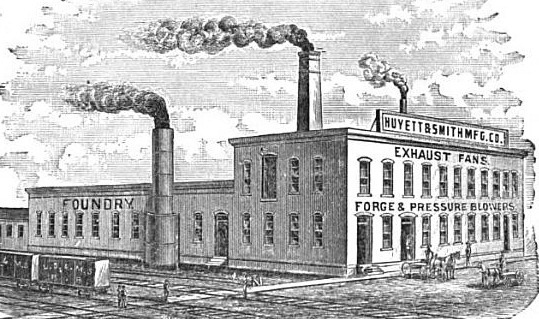 It all started back in 1881, when an organization called the Huyett & Smith Manufacturing Company was founded as a partnership by a pair of Detroit natives, M.C.Huyett, a mill owner and W.D.Smith, a millwright who invented a "double-discharge" exhaust fan while employed at Huyett's mill. Mr. Smith fought in the Civil War, rising to the rank of Captain in a Michigan regiment. He survived internment at several prison camps, including the infamous Andersonville, before escaping toward the war's conclusion. Located at 6000 Russell St., Detroit, they created a successful business around the Smith Fan, used for carrying off shavings in wood-working shops, on the believed premise that it greatly reduced the horsepower required to do a given amount of work. It was only many years later that this claim was proven false and the fans discontinued. Rounding out their sales were heating apparatus consisting of fans and steam coils, and ventilating fans. The need for additional capital led to incorporation in 1885 with $100,000 in capital stock. 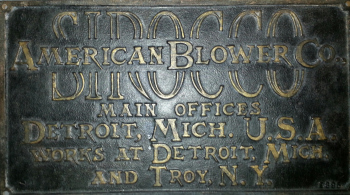 When Smith departed in 1895(Huyett had already severed his connection in 1884), the company was renamed the American Blower Company. A new era began in 1890 when the Treasurer resigned due to health reasons and was replaced by a local small business manager. James Inglis, the 26-year-old son of Scottish immigrants, was the driving force for the next 50 years making the most of Smith's inventions and foreign licensing agreements to turn ABC into a major success. In the early years, though, he had to contend with interference from the owner of B.F.Sturtevant. This tense and ultimately litigious relationship was initiated by Inglis around 1908 as a means of thwarting a conspiracy to replace him. Upon learning that the nephew of a majority shareholder was targeting his job, he proceded to get options on a large block of stock and sell it to the only interested purchaser, Eugene Foss. They couldn't be freely voted since they resided in a trust but Foss used his position of strength to pressure Inglis over the next five years to agree with him on such matters as prices, fan design and the division of sales territories between the two companies. Inglis also claimed he proposed stealing competitor's employees, engage in fake bidding and that Sturtevant should have use of the Sirocco trade name. By 1913, fearing the impending expiration of the voting trust would give Foss the freedom to elect a sympathetic Board of Directors, he sought legal counsel to enjoin him and his associates from voting their stock. 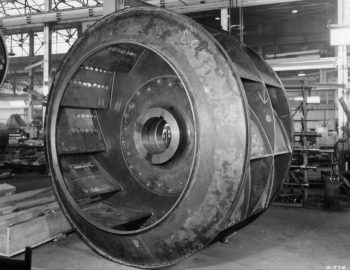 Preceding under the Sherman Act, the company succeeded in getting a restraining decree using the argument that a combination would result in a monopolistic 70% market share and that Foss could waste the business of American Blower in the interest of Sturtevant. In an ironic twist, following a series on injunctions between 1913-1917, Foss eventually won a partial victory on appeal allowing him to vote his shares coincidentally while experiencing severe financial difficulties that forced him to dump those very shares. Inglis gained complete control by going to Boston and purchasing the Foss shares. After two years of unsuccessfully attempting to disprove the Sirocco's effectiveness, American Blower changed tactics and entered into negotiations to purchase Davidson's sole American outpost, Sirocco Engineering of Troy,NY. Its primary asset was the right to manufacture Sirocco Fans under Davidson patents. Following their merger, the company was capitalized at $1,500,000 with 20% going to Sir Davidson and his American shareholders. William Redfield, formerly president of Sirocco Engineering, became vice-president. According to Davidson Co. lore, the Sirocco name came to be during the course of fan and dryer experiments due to a casual remark of a planter friend who visited the Davidson works to see a test on one of the dryer machines. Surprised at the volume of hot air it produced, he exclaimed, "Why, its just like the Sirocco wind that blows off the desert." To Samuel Davidson, the name was so apt that he immediately adopted it as his trademark. A few years later American Blower introduced the Sirocco high-velocity Cyclone dust collector which was enthusiastically received by steam generating power plants and by other industries that required highly efficient dust removal capacity apparatus. Industrial growth in Canada developed a market for American Blower products and in 1912 the subsidiary Canadian Sirocco Company, Limited was established in Windsor, Ontario, expanding over time to 80k sq.ft. In 1913, they purchased the air washer interests, including the patent rights, of McCreery Engineering Co. of Detroit. Fourteen years later, in 1927, American Blower was acquired by American Sanitary and Radiator (now known as American-Standard) for $4,000,000 in stock and became officially known as the American Blower Corporation. Inglis, replaced by Clark Morse as President in 1933, served as Chairman through the 1940s. American Blower continued its pioneering ways in 1930, when it acquired exclusive rights to manufacture and market Gyrol Fluid Drives in the United States. Using Hydrokinetic (hydrodynamic) principals to transmit power from a prime mover to a load, simply, reliably and efficiently, Gyrol Fluid drives combine the characteristics of a pump and a turbine. Among their benefits are infinite variable speed control and shock/torsional vibration absorption. The growing demand for American Blower products made increased facilities necessary. In 1935 a new plant was built at Dearborn, Michigan. Successive additions brought the total floor space covered by the plant to 429,100 sq.ft., including the modern research laboratories and general office building, which were erected in 1941.Shortly after the opening of the Dearborn plant, the company found that it needed still more production capacity to meet the demand for its growing line of products. So a plant was purchased in Columbus, Ohio in 1936 and eventually expanded to more than 335,000 sq.ft. of floor space.. In 1943, the Columbus plant was awarded the coveted Army/Navy "E" Award which was given to industries achieving excellence in production during WW2. By the early 50s, it employed nearly 500 workers. Following WW2, the Russell Street plant was sold and production of the heavy industrial and commercial equipment was carried on in the Dearborn plant.The industrial boom on the west coast led to the construction of a plant in San Leandro, California in 1949, and a major expansion in 1952 with floor space increased to 70,000 sq.ft. American Blower products were sold worldwide through 75 sales offices in the United States and Canada. In 1957, they became a division of American Standard.In 1959 the Industrial Divison was formed, consolidating the American Blower, Kewanee Boiler and Ross Heat Exchanger Divisions. The Kewanee boiler assets were sold to Kewanee Boiler Corporation in 1970 which eventually went into Chapter 11 backruptcy in 1986. Included in this product collection was the TONRAC packaged centrifugal liquid chiller, a name with an interesting historical origin. Designed by Vice-President Richard Bernhard (1950-1964), it was derived by reversing the surname of Nicolas Carnot, the father of Thermodynamics. The company was purchased by Davidson Fan Co. (Belfast, Ireland) in 1981 which then changed their name to American - Davidson with a domestic employee headcount of 650. In l985 they sold the Series 134 Sirocco line, the Series 142 Utility Set line and the Series 203 Vaneaxial fan line to Penn Ventilator Co., Philadelphia Pa. Penn Ventilator has since abandoned the three product lines. That same year Sturtevant was acquired from Westinghouse. A year after Davidson was purchased by Howden Fan in 1988, the Dearborn plant was closed and a mere 25 employees were left for service in the fluid drive department. Howden-Buffalo closed and relocated that service department in 2010. Production of the American Blower / American Standard line didn't stop, though, with closure. Howden purchased the American Davidson name but sold off most of the fan lines. International Industrial Fan (South Boston, Virginia) acquired the rights to manufacture the American Blower Fans Series 134, 81 and 82 HS and AFB,Series 106 Industrial Exhausters, Series 86 Cast Iron Blowers and Series146, 1500 and 1400 RT fans. The heavy duty products were retained by Howden. In 2001, International Industrial Fan closed their factory and sold the entire business to Alphair Systems (Winnipeg, Canada) which continued using the reference drawings and tooling that originated from Dearborn. Alphair became a subsidiary of New York Blower in 2009. After a profitability review, NYB has decided to end support of that ABC product line. Any questions about ABC fans and service should be directed to Howden.